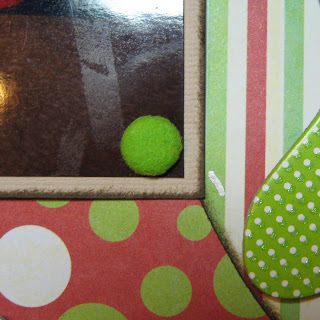 Okieladybug's Scrap N' More: A layout? WHHHATT?? I bet ya'll forgot I did layouts huh! *okie cracks up laughing* Now some of you probably will remember the days when that is what I mainly did. I would do a card every now and then but layouts were my game. Somewhere along the line I never posted this layout! Not sure how that happened. Well actually I do know. I have a lot of layouts that I never posted to my blog because it was before I was posting so frequently. I started my blog almost 3 years ago to share my cut files, so I didn't always post what I was making. Anyhow, this is a layout of my daughter when she was a year old. I had put the Christmas tree up and I had to take it down because she kept kicking it over! I so love the picture of her trying to run off when I caught her messing with the tree AGAIN. I believe the title was cut with Christmas Cheer. 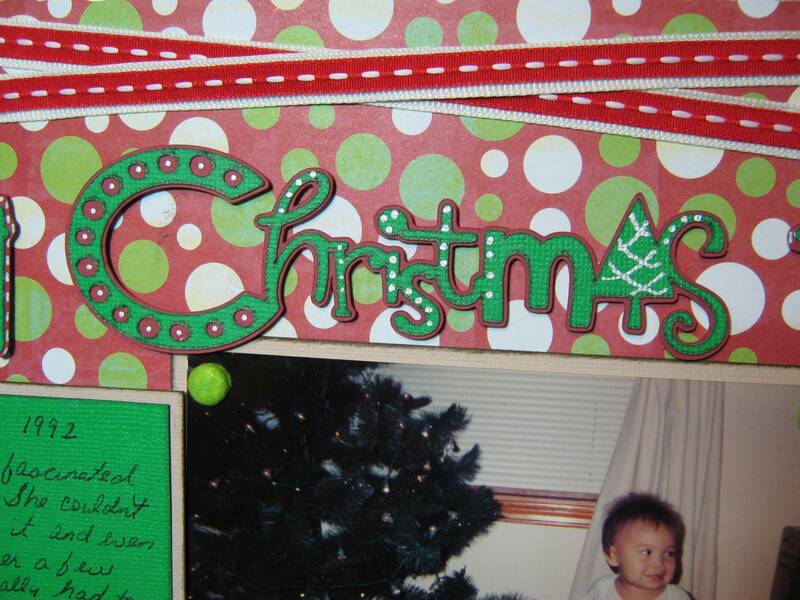 The embellishments are chipboard embellishments that I purchased. I did a lot of doodling as you can tell. 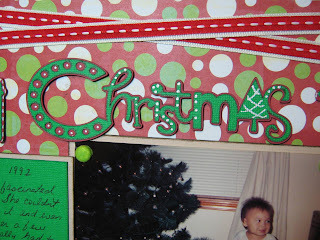 The paper is from a DCWV Christmas stack from a few years back. 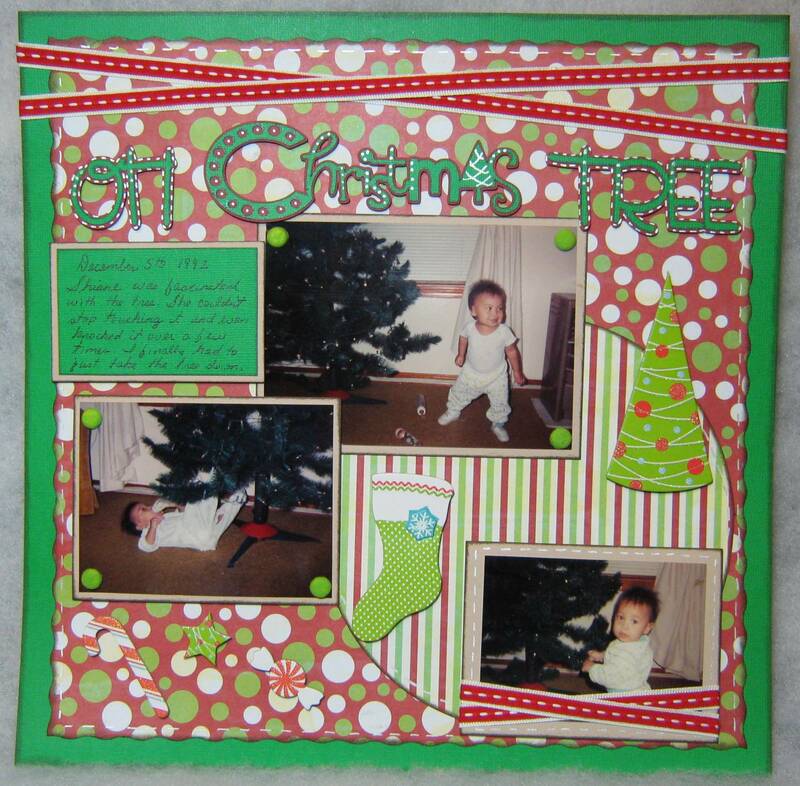 The ribbon was something I thought really added to the embellishment of this layout. I use mostly grosgrain ribbon but every now and then I find ribbon that has a little something extra to it and just can't resist paying a little more for it. I used some brads that I flocked myself. Those are simple to do but take a little while to dry. I just dipped the brad in Scotch Quick Dry glue and then dipped them in flock. If you want to try this yourself you can also use Glue Dots, just make sure they cover the whole brad. I was glad to find this layout to post tonight since I didn't get to take pictures of the cards I worked on this weekend. I went to see Naomi and they hadn't moved her to her new room yet and I thought they must have decided to wait until tomorrow. But, all the sudden her family swooped in and before I knew it I was grabbing stuff out of her closet and bathroom and shoving stuff in drawers and moving things around! LOL Maybe I need to look through more of my pictures to see what I haven't posted from the past! What a cute layout! Love the doodling and the flocked brad. Thanks for bringing it back to post on your blog! Cute layout! Thanks for sharing. I would tie the top of my tree to curtain rods on windows on either side of the tree just to keep it from being knocked over. They liked to get under and in it. Love your page and the story behind it. Hope Naomi likes her new room. You are a good friend. Posting can wait! Thanx for the tip on using a glue dot on the brads to add glitter or flock ... what a great idea!